Well, actually, the first bit was with Camera distinctly not in hand. As is the norm for Doctor Who under Steven Moffat, the actual 'experience' bit of The Doctor Who Experience is a strictly no-pictures adventure, for fear of spoilers - but that's not going to stop me from describing exactly what happened in the experience through the medium of text anyway. TAKE THAT, MOFFAT. Spoilers ahead of course, if you're looking to visit the experience soon! Ushered into a small cinema-room by our 'Companion' - a lovely Cardiff-born lass named Lucy - you're first treated to a bit of a montage covering Matt Smith's era as The Doctor, up to but not including Series 7 (in order for Parents and non-fans dragged along to catch up with what the deal is). Then suddenly a crack in time and space, not at all dissimilar to Amy's, opens up in the middle of the screen with walls pulling away to reveal a new room, a museum of Earth History on Starship UK. With a droll service node (actually one of the props from Silence in the Library with an actress' face projected onto it) pointing out bits and bobs dotted around such as the Telescope from Torchwood House and the Calvierri throne from Venice, it's all a bit meta with an in-universe excuse to look at props from the show... until the room violently shudders as screens flicker on and off, revealing a message from the Eleventh Doctor himself! Looking for Amy and Rory, The Doctor has somehow managed to get himself trapped in The Pandorica 2 (let it not be said that Steven Moffat, who penned the experience's 'story', is lacking in originality), but has instead found your tour group - or as he derogatorily describes you, 'shoppers' - to help him instead. With a wave of the sonic screwdriver, The Doctor locks his TARDIS onto your location, which reveals itself behind a wall on the other side of the room, before you're ushered into the now-old console room to help free him. The Experience originally made its début at the London Olympia in 2011, before making its way to Cardiff last year, so it's a little out of date now - however this is slightly rectified by a hastily slotted in bit of VO from Matt Smith. As you enter the TARDIS, he apologises for mentioning Amy and Rory instead of Clara, and describes his old console room as an 'archived shard' within the TARDIS's memory banks. Matt Smith's actual hands! Well, hand prints. I imagine he's currently using his actual hands. That'd be a bit gruesome, otherwise. Speaking of Gruesome though, this was the mannequin they had showing off The Doctor's togs from Series 7. Eurgh! Not entirely flattering to poor Matt. There were monster masks in the exhibition less petrifying than this. ... the old TARDIS console room - reportedly used for filming in the 50th Anniversary, when the crew shut the Experience down for an afternoon (Roath Lock, BBC Wales' purpose built studio complex and home of Doctor Who, is literally a 2 minute walk away from the experience) - looking a bit worse for wear. Not pictured: the video screen to the right showing Davey T's regeneration, which was surrounded by women of all ages cooing and in some cases, actually crying. The wound still cuts deep, 3 years later. The First Doctor's TARDIS console, from the upcoming An Adventure in Space and Time. Pictures cannot do this thing of exquisite beauty justice! I cannot wait to see this in action later this year. Classic Ice Warrior! Not as furry as I remember them being, but still lovely none the lessssssssss. Sontarans old and new. I knew the NuWho Sontarans were short, but I had no idea just how much shorter they were than the classics! The Cyber-conversion unit from Closing Time. I have no idea why I took this picture, because all it did was remind me of the resolution of Closing Time, and was thus I was immediately infuriated. I can't remember what episode this was from, but I loved it. Spooky Cyberface is spooky. Clara didn't have much of a presence at the exhibition, except for this little section dedicated to Oswin Oswald in both human and Dalek form. K-9 faithfully guards the entrance to the hall of Companion outfits. MY BABY. I came this close to actual clothes worn by the actual Arthur Darvill! I was seriously tempted to touch them, despite there being several members of staff nearby and a ton of 'DON'T TOUCH' signs everywhere. Weeping Angel cherubs, just having a bit of fun. Not creepy, not creepy at all. What do you call a group of Daleks? A Murder? A Collective? A Gathering? A... Paradigm? Poor Skaldak was all chained up to some missiles, just as he was in Cold War. Kind of a shame, because the Ice Warrior redesign is a gorgeous piece of costuming - I would've loved to have been able to snap a few pictures of the Marshal standing proud. Oddly tucked away from the rest of the Cybermen was the new Gaibermen redesign from the otherwise ho-hum Nightmare in Silver. I love the Cybermen anyway, but this is far and away my second favourite Cybermen design in the show's history (sorry, nothing beats The Invasion). So... I went a bit overboard on the pictures. Oh, you beautiful silver cyborg. You deserved better. The mechanism behind the Ood prosthetic is actually a bit scarier than the look of the creature itself. Time Lords, lookin' all Timey and Lordy and stuff. The detailing on Eric Robert's costume from the TV movie was rather exquisite. You could say that he was... drezzed for the occasion. Concept art! A lot of this comes from the wonderful Peter McKinstry, who was a Concept Artist on the show from Series 2 till Series 5. He's currently working on the fourth season of Game of Thrones. Poor Neve McIntosh's head, nestled in a display on costuming in the show. Tom Baker Scarf? Tom Baker scarf. Of course there's a Tom Baker scarf here! Interesting little tidbit found in a display of scripts and signed promo pictures from BBC Wales - The Hungry Earth was originally going to be called Unearthed or The Ground Beneath Their Feet. Something to learn, even for diehard Who fans! Despite the shortness of the actual 'experience' bit - it's about 20 minutes, and then around an hour or so to have a good poke round the exhibition - The Doctor Who Experience is a pretty fun trip out for a Who fan, if only just to see the gorgeous array of props and costumes in the exhibition itself. And at £13 for a standard Adult ticket, surprisingly cheap! 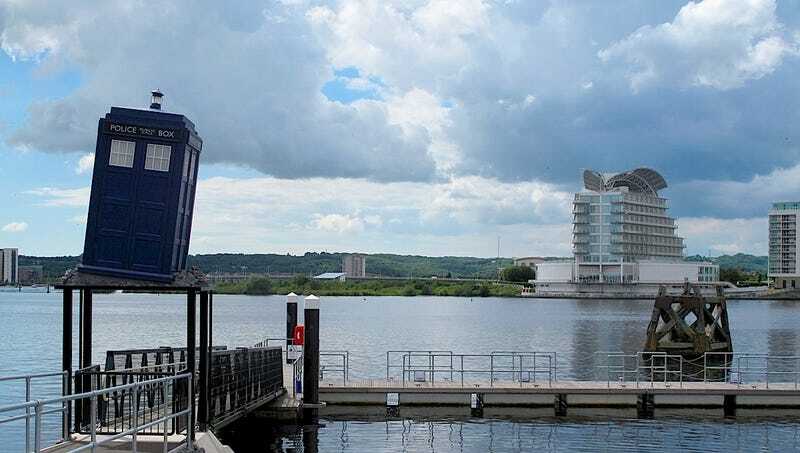 If you're interested in taking the trip down to Cardiff Bay, you can book tickets here.